Deceptive labeling! A $6.97 list price for this two-DVD documentary should have tipped me off to something wrong. This DVD set includes two separate documentaries, "Kamikaze" and "War in the Pacific," produced by separate companies. 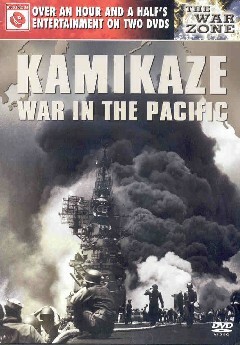 The "Kamikaze" documentary has the label "War in the Pacific" on the DVD, and vice versa. This carelessness in labeling foreshadows the quality of the historical account found in "Kamikaze." Although the DVD container gives the copyright as 1999/2004 by Eagle Rock Entertainment, the "Kamikaze" documentary is the same as a video entitled "Kamikaze: To Die For the Emperor," which has an original copyright year of 1991. The following web page details the historical inaccuracies and poor production quality of the original video: Kamikaze: To Die For the Emperor. The documentary entitled "War in the Pacific" has a different production company, and it appears to be of much higher accuracy and quality. This documentary covers the entire Pacific War, but it makes no mention of Japan's kamikaze operations. The "Kamikaze" DVD also contains about ten minutes of interviews with three World War II veterans.